Today found me up at the early hour of 4 a.m. Considering I didn't get to bed until after midnight, that just wasn't enough sleep. Since I couldn't get back to sleep, I got up and made a card. Isn't that what you do when you can't sleep? There were several challenges this week that I wanted to participate in and it worked out that this card fit the bill for them. I love how that works out sometimes. I'm going to keep this short as I have a few photos to add to the post. 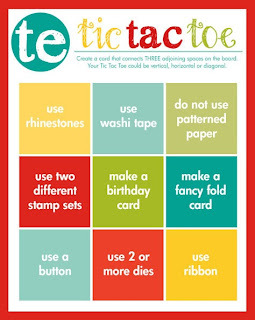 First, is the Timeless Tuesday Double The Ribbon Challenge over at Flourishes. 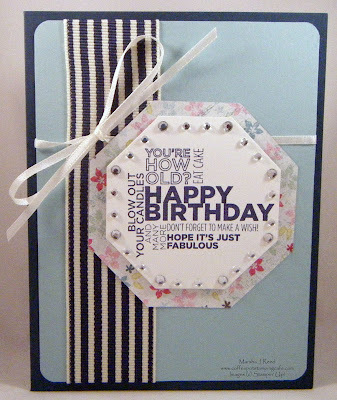 The challenge was to use two kinds of ribbon. I used a wide ribbon and a narrow ribbon. Here's how I used them. Taylored Expressions is turning five this week, so I've been playing along with all of the fun challenges and games they've been doing. 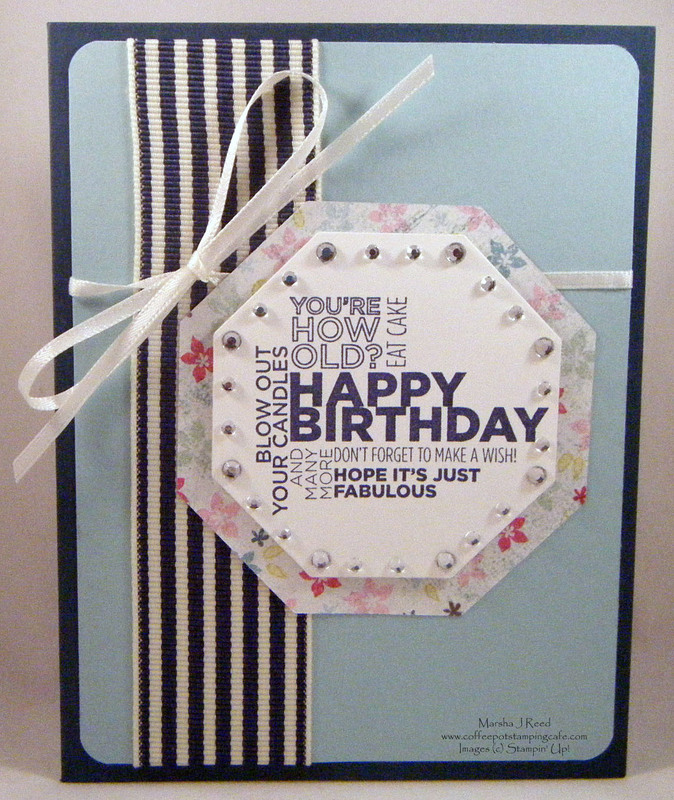 This one was to play Tic Tac Toe which is why you see , rhinestones, happy birthday and ribbon. I'll be posting this to the Splitcoaststampers Gallery. Click on the image below to head over to the Taylored Expressions blog and see all that's happening to celebrate their birthday. 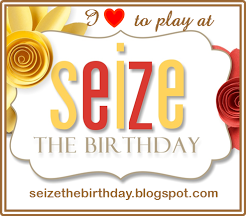 A relatively new challenge for me is the one at Seize the Birthday. 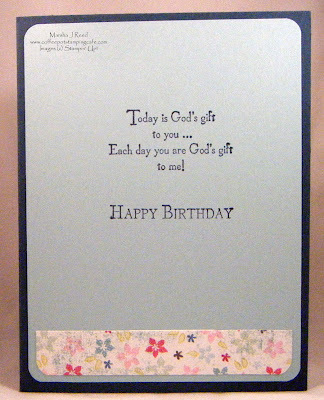 All you do is make and post a birthday card. Since I always seem to need birthday cards, this gives me the opportunity to stay on top of those cards I need to make and send. Click on the image below to head over and see all the great projects. 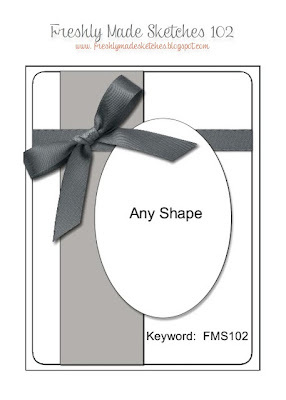 Here is the wonderful sketch I used for my card. Click on the image below to head over to the Freshly Made Sketches blog. I love the clean and simple look of their sketches. This, too, is new to me. Whew! A much longer post than normal but it was such fun to find all of these great challenges. Now I'm off to find a new challenge to join. Great combination of the challenges. I love the ribbons and the bling! Thanks for joining us at Freshly Made Sketches. I love the double ribbons! And all the bling! Thanks for joining us this week at Freshly Made Sketches!